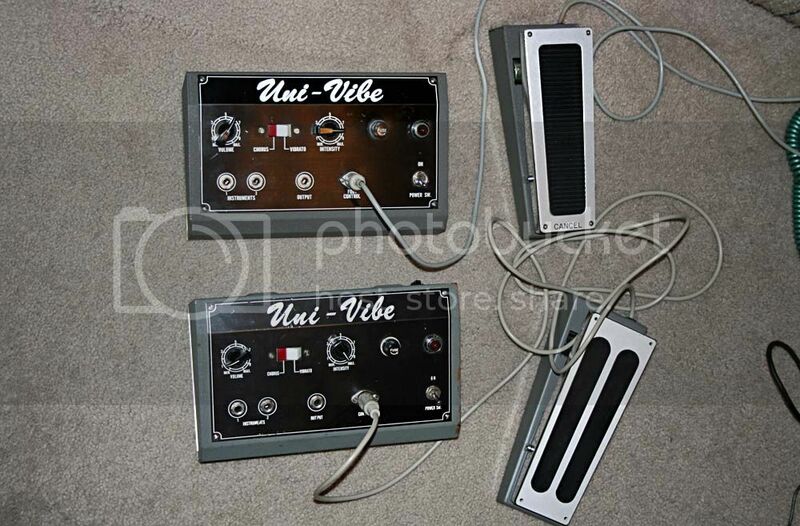 Vintage Uni-Vibe owners (past & present), tell us tales of tone euphoria! Discussion in 'Effects, Pedals, Strings & Things' started by Eskimo_Joe, Apr 20, 2016. I'd be interested to hear about your experiences with vintage Uni-Vibes? Believe the hype or over-hyped? How do they compare to modern boutique vibes? Do they hold up pretty well or do they require maintenance of some sort? jimmycupo and MrMoose like this. This thread is relevant to my interests. I have 4 or 5, one of them sounds really amazing. The mint in box one, not so good. The others sound fine. We have been comparing all the repros on the market to my best one and they are getting close! Pedro58, Phase45child, wundergussy and 5 others like this. Echomachine and jm9239 like this. Have you A/Bd it with a Mayer VoodooVibe+ ? Echomachine, Eskimo_Joe and bog70 like this. My gray cord Uni Vibe utterly destroyed the gold Deja Vibe I used to have on my board. The Vibe Machine, though I don't have it anymore, really stood its ground, that thing sounds great. Whose repro do you have in this pic Mike? I have an early two striper and it has literally written songs by itself. Either you don't know what "literally" means, or you should call a paranormal investigator. Supercubziggy, MrMoose, gearscrubs and 1 other person like this. I have played thru a few and only ever found ONE during all my years as a "picker".....and to be honest, while it sounded good, the fulltone dejavibe version 1 I had sounded better to my ears. if you want a vintage one, you're gonna need to have someone like Analog Mike get it back up to spec for it to sound great. and there are SO MANY really nice modern versions of that pedal about.....why bother with the expense and grief of having a vintage one? get a fulltone deja vibe, or a FOXROX Aqua Vibe, or a Sweet Sound Ultra Vibe, or even a VoodooLabs vibe (if you're on a budget) and get your vibe ON! I have two vintage units. Both sound different, both good/great but whenever I hook one up I find myself longing for an Aquavibe or a Captain Coconut Provibe. I guess it's just what I'm used to. Univibes from back then compared to the best of the current vibe clones is similar to Fuzz Faces back then compared to the best FF clones. Back in the day, they built the units up and if they worked, they shipped'em out. They didn't have a guy sweating it out in a room, making sure each unit sounded "right". Also parts values can drift over time, especially the photocells. Most vintage Univibes sound at least a little different now than they did when they were new - for better or for worse. So there are a lot of old duds out there. But at the same time, people have different ideas of how a vibe or fuzz should sound. So one guy's dud is another guy's gem. KnowTalent, jimmycupo, analogmike and 3 others like this. Here's a video I made a few years ago while fixing a vibe that a guy sent in. Echomachine, Terry Hayes and k tone like this. I own a FT Mini Deja Vibe 3 that sounds good to me, but I never owned a vintage unit, so I have no point of reference. Maybe someone could share some of their knowledge on this. So there are a lot of old duds out there. But at the same time, people have different ideas of how a vibe or fuzz should sound. So one guy's dud is another guy's gem. I agree with these comments. I believe they speak for themselves without clarification. In any vibe thread, keeping these ideas in mind would give context and greater understanding to the contoversy that arises as a result of a search for "best". The selection of a vibe usually comes down to personal preference of what sounds "good" rather than a consensus on "best". IMO, a perfectly valid comment is "I like this vibe because it sounds good to me". Giving reasons would be a plus. That should limit the controversy, but ultimately, it means we have to try several to find what we like. From time to time a question like this appears, "How close does a certain brand of vibe compare to the sound of an original, vintage Uni Vibe? If all vintage Uni Vibes sounded the same, an A/B test would provide the answer. But with so much variation among vintage units, there is little consensus on how to describe their sound. In making a decision to acquire any type of gear, a good place to start is finding something that has a personal appeal. How well the gear compares to an original should be secondary, IM0, because the original might not be your preference. Pedro58 and Eskimo_Joe like this. Didn't care for the UniVibe that I had. But I am interested in the Strymon Lex.